Are you someone your colleagues and customers want to work with, or have to? Do you know? Take the guessing out of working with others. Give other departments what they want, when they want it, how they want it. Improve your and your department’s reputation by finding out how you’re seen by your internal customers. Get more feedback enabling you to take control of what you put in front of others and the impressions you create. And as a result, build long lasting business relationships that outlast economic downturns, miscommunication and conflict. Manage your professional brand and career. Raise service levels and increase both internal and external customer satisfaction. Start colleague relationships powerfully and strengthen existing relationships. Create smooth working relationships. Communicate with people how they like to communicate. Take the mystery out of working with others. Find out what your customers need to feel well served and satisfied. Take control of your career and department’s reputation. Manage your professional brand. Learn more about the business goals, objectives and challenges driving your organization. Become more knowledgeable about customers’ needs & how to meet those needs. 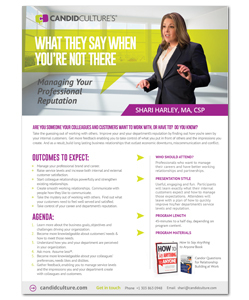 Understand how you and your department are perceived in your organization. Become more knowledgeable about your colleagues’ preferences, needs, likes and dislikes. Gather feedback, enabling you to manage service levels and the impressions you and your department create with colleagues and customers. Business focused; direct; fast paced; engaging and fun. Participants will learn exactly what their internal customers expect and how to manage those expectations. Each person will leave with a plan of how to quickly improve his/her department’s service levels and reputation. Professionals who want to manage their careers and have better work place relationships. 60-minutes to a half day, depending on content.